It is amazing the kind of lightweight, long battery life laptop $350 will buy these days. That’s the going rate for two superb highly portable netbooks: the Acer Aspire One and the Asus Eee PC. Both are excellent computers but each has some flaws too. Which should you choose? Read on . 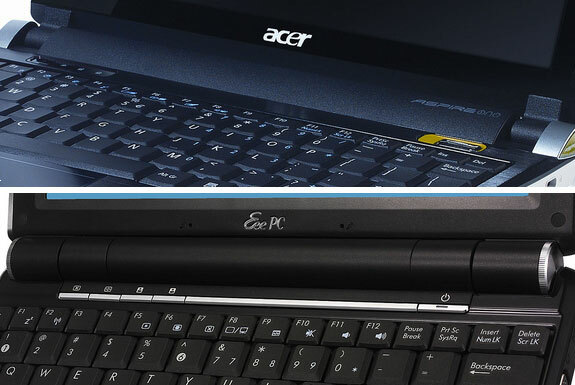 . .
For this review we are comparing the Acer Aspire One AOD150-1165 model with the Asus Eee PC 1000HA. Acer and Asus each make variations of their respective notebooks with different feature sets. What’s amazing about comparing these models is how similar they are. Both have a 10 inch screen, 1024 x 600 pixels, with excellent brightness and clarity. Both come with a 160GB hard drive, a 1.6 GHz processor, 3 USB ports and a multi-card reader. Neither has a built-in CD/DVD drive but with both you can use an external drive to watch a DVD or run a program off a CD. Both laptops are roughly the same size and weight (3 lbs / 1.3kg). And both currently cost $350 through Amazon.com. Both the Asus and Acer models we tested come with an integrated microphone and webcam. The Asus’s webcam is 1.3 megapixels. The megapixels of the Acer’s webcam is, well, somewhat of a mystery. There don’t seem to be official specs on it from Acer but several unofficial sources put the webcam at a scant 0.3 megapixels. Our own use bared this out. When made a Skype video call with each laptop the Asus’s webcam definitely produced the clearer and brighter picture of the two. Both laptops provided sound quality typical of most lightweight laptops. First, the Asus has a half-sized right SHIFT key that’s placed in an odd spot on the far side of the up arrow (see photo, below). The Acer has a full-sized right SHIFT key. (Though, it should be pointed out that many typists never use the right SHIFT). Second, the Asus’s keys felt a big “plasticy” to us. The Acer keys had a more solid, satisfying feel. After an adjustment period we were typing on the Acer nearly as comfortably as we do on our full-sized MacBook keyboard. We love when mistakes work in our favor. Acer was supposed to ship their D150 with a 4400mAh battery that would give the laptop about 5.5 hours of plug-free use time. Instead, the initial batch of laptops were sent out with 5800mAh batteries. These last up to 8 hours! At least as of early-March 2009 the better batteries were still being installed, at no extra cost to you, on Aspire One’s shipped through Amazon. If you are on the verge of buying an Aspire One AOD150 you should do so as soon as possible! The Asus, like the Acer, has a 6-cell battery. It supposedly lasts 7 hours. As with all laptops, how much battery operating time you have depends on what you are doing. We used the Asus to surf the internet and work on Spot Cool Stuff at a coffee shop and had it lasted a few minutes north of 5 hours. When we used it for word processing, with the wifi off and all the power saving features activated, we got about 7 hours and 40 minutes of usage time. Note that both computers have upgraded batteries that can be purchased in addition to (though not instead of) the factory installed battery. For the Acer there’s a 9-cell battery that can last 12 hours, for the Asus consider the 8-cell 10,500mAh battery for 11 hours of use! For discounted batteries check out Laptops For Less. Advantage: Asus Eee PC 1000HA (unless you buy your Acer now and are fortunate enough to get one of the free upgraded batteries). While Spot Cool Stuff is a huge fan of both of these laptops we find each of their touchpads flawed, though for different reasons. On the Acer the problem is that the touchpad has only one key. You can control-click to get the equivalent of a right-click but this can be frustrating to get used to if you aren’t already (and not the best user experience even if you are used to it). On the Asus the touchpad keys wrap around the front of the computer such that you can click on them by either pushing down (like on most laptops) or pushing horizontally (eg in a motion parallel to the desk). Clicking down the keys are very stiff. Clicking horizontally is not a motion people are used to when operating a laptop—some users don’t like the adjustment though others seem to prefer it to the click-down method. Given these trackpad issues we suggest you pair either of these laptops with the excellent, portable, Arc mouse. The Asus comes in two colors: ebony black and pearl white. The Acer comes in four: seashell white, sapphire blue, diamond black and ruby red chassis. And that’s not the only advantage the Acer’s design has over the Asus. Though both of these laptops are cool looking machines, to our eye the Acer strikes a sleeker profile. It also has a more solid feel. If you do get the Acer beware that the exterior of the diamond black model picks up finger prints easily. The Asus Eee PC 1000HA. Since we always travel with our Arc mouse the Asus’s trackpad issues are of little concern to us. And as frequent Skype users we love the better webcam on the Asus and can happily live with its keyboard. Combine that with superb battery life and a solid all-around design and you have a winner. 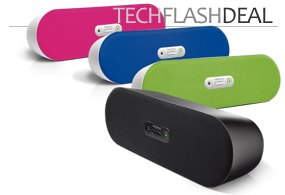 (Note: for $30 more you can upgrade to the Bluetooth enabled 1000HE model). Of course, there’s always a third option: Buy both. I had the ASUS Eee PC. My girlfriend has the ACER. You’ll notice I used the past tense for the ASUS. That’s because it blew up!!! Useless machine which has cost me a fortune replacing the furniture in my living room. I’m just lucky I wasn’t sitting in front of this machine. It should be banned from airplanes as it’s just like an IED. And the company has been a disgrace in dealing with the problem. I have bought a new laptop and made sure it didn’t include any hardware from ASUS. I’vew still got bits of the machine lodged into my ceiling because the explosion was so powerful. I do not have an answer but a question. I am reading over these answers and recommendations but I do not see anywhere about being wireless notebooks on the contrary I read about Ethernet cable several times…. Do I need to be connected to the internet using an Ethernet cable? I did know about power cord and have bought adapter.. Didn’t know about the ethernet cord so will buy one before we leave. Thanks a bunch!!! Thanks for info. Purchased the Asus. Dumb question. Going to Italy where the “restored monastary” has a DSL connection. Will I be able to use my Asus? Do I need to take some kind of cord with me? Thanks in advance for helping a novice. Congrats on your purchase. I hope you like it. When you mention this cord, I’m not sure if you are talking about an Ethernet cord (eg. to plug into the DSL high speed modem) or a power cord. Thanks for the follow up, both Mark and Tom. It seems like subsequent Aspire One models made upgrading, easier, which is good. Fortunately, our slight preference for the Asus had nothing to do with the upgradability. The preference was slight, though. We though both the Acer and Asus netbooks were excellent. Tom is right. I got the same model as he did, Aspire One D-150-Bb with 10″ screen size. Down at the bottom, they now have easy access to RAM and HDD. (unlike the aspire one with 8.9″ which you would have to remove the keyboard to acces the mainboard where you would install the memory). It will take you less than a minute to upgrade the momory or HDD. Ok, I purchased the Model D150-1165, which is the 10 inch model. It came with the 5800 mAh 59 Wh battery which is getting almost 7 hours of use per charge with the screen at about 60% brightness. I did upgrade the ram in it to 2 GB and it took about 30 seconds. This netbook has easily accessable doors on the botom. One houses the Memort Module (RAM), and the other two house the Hard Drive and Wireless Card. I dont know what unit you guys recieved and evaluated but youre wrong. This little netbook was very easy to upgrade, has better benchmarks than most other netbooks and also is alot less money. And you dont have to order it online and wait for it as it is readily available in most Fry’s and Microcenter Stores. I would recommend this little powerhouse to anyone looking for a NETbook. Just my 2 cents. The ACER’s memory is very easy to upgrade. You just open the memory module cover, remove the installed stick and install your own. I dont know who told you it’s hard but they are wrong. OK, we really should have included a review of how to upgrade the memory on each of these units. Our fault. On the Asus 1000HA (and 1000HE) . . .
. . . there’s a panel on the back, attached by two screws that can be opened by a normal screwdriver (or even a knife). Under that panel is the hard drive and the RAM memory chip. Either can be replaced in literally one minute. On the Acer Aspire One model we reviewed . . .
. . . the memory is upgradable. However, doing so voids your warranty. And we should not describe the process as “very easy” like Tom did. (But then everything is relative.) On the Acer, the upgrade process involves removing six screws and the two feet from the back (this requires an especially small screwdriver), then you have to push in on clips at the top front of the keyboard, then remove the entire keyboard, then remove four more small screws and disconnect the track pad, then remove four more screws, then disconnect the wireless card, then lift up the motherboard and install the RAM underneath. Then, of course, you have to reassemble the whole thing. How long that takes depends on your level on confidence and how fast you work. 15 to 40 minutes, maybe. Of course, once the RAM is installed it is done and you don’t have to bother with it again. So maybe the difficulty of the RAM install process should not be a factor in your decision. Still, upgrades on the Asus are clearly easier. Thanks for pointing that out. You are completely right: The Asus is significantly easier to upgrade. Great that you like your Asus as much as you do. Fun to use and portable are great adjectives to sum up that nifty little netbook. I recently purchase the Asus model you reviewed, after extensive research and reading other reviews on the web. I’d like to mention one thing you have neglected to mention about either of these models, and that’s their memory upgrade possibilities. I too, was almost swayed to the cooler looking Acer. However, besides the poor webcam, the difficulty of memory upgrade solidified my decision against it. Even getting the memory on this model requires following detailed instructions verses the Asus upgrading the memory in about two minutes flat. I don’t mind the keyboard on Asus, although I always forget where the delete key is. With daily use, one adjusts. Perhaps I’m just a geek at heart, but this was one of the best purchases I’ve made in a long time. It’s totally fun to use and so portable.